NEWSFLASH - CAMBODIA has been tipped once again, recognised as one of the world's newly explored holiday regions in Asia. We're always on the lookout for fine holiday travel destination solutions for our Corporate customers, and 4 Rivers Floating Lodge in Cambodia stands out - anything but 'the norm'. Picture yourself here; gently rocking on the Tatai rivers tidal flow, your tented villa is the last word in outdoor luxury. At a generous 45sqm it is filled with quality furnishings, well equipped bathroom, a spacious sundeck and flat screen TV plus free WiFi, all the luxury and high-end facilities you need in a four-star boutique resort. 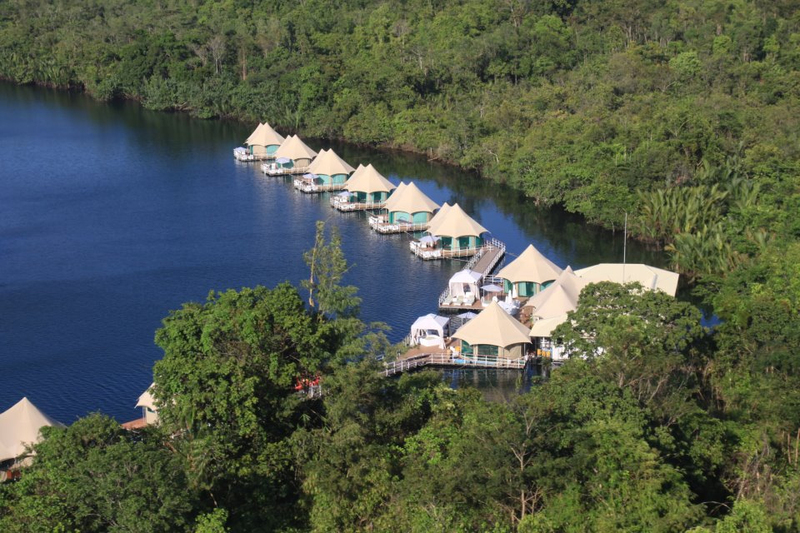 4 Rivers Floating Lodge rests in the fold of the Tatai river the forest reaches out to meet you. The peaks and river valleys of the Cardamom Mountains are home to 59 rare and endangered species. Trekking tours into the jungle offer you the chance to discover the customs, beliefs and natural cures of the inhabitants of the Cardamom Mountains and its forests. You can follow the spore of its secretive wildlife and experience first hand the sights and sounds of an untouched tropical paradise as you penetrate deeper into the undergrowth. If you're tempted by the sounds of Cambodia and 4 Rivers Floating Resort, add it to your TO DO list and be one of the first to explore this nation's natural beauty! Call Kimberley (toll-free) on 1800 678 555 or email for booking information. DBT Corporate Travel understands the needs of our travelling executives when it comes to holiday time... you want something unique, you want something affordable and moreover you want it managed in the same professional way we attend your business travel. Attention to detail; no if's - no buts. Book your holidays with someone who already understands you. DBT. We have a Paradise - ready for you.